This product was added to our database on Friday 22 January 2010. 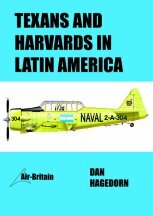 Nowhere were the classic North American Harvard and Texan advanced trainers and light combat aircraft more synonymous with military aviation than in Central and South America. Over an incredible 72 years, ending only recently with the operational retirement of T-6s in Paraguay, the NA-16 and its descendants ruled the skies of this region.